The directions to this route are very straight forward. Start the route in Harrison Arkansas and simply head south on Route 7 all the way to Hot Springs Arkansas. On this route you will travel through two national forests and one national park. The route takes you from Harrison to Hot Springs Arkansas and you should plan on taking a few detours if you would like to see more of the countryside. You'll be traveling through the rugged Ozark Mountains and see canyons, lakes, rivers, forests and ample wildlife. For those of you who never thought of Arkansas as a state with outstanding scenery, this route may change your mind! Photo contributed by a visitor in July 09: "Taken from the scenic pull-out at Buffalo River Canyon. This is a beautiful ride and the traffic is minimal." This is among the best of motorcycle roads in all of Arkansas. Plenty of twists and turns, hills and valleys to keep you leaning and grinning. Photo contributed by a visitor in July 09: "Arkansas's Grand Canyon just short of Jasper." The route running from north to south starts out in the quaint town of Harrison where you will find ample lodging, a collection of small craft shops and museums. Heading south, many of you will enjoy a tour of Mystic Caverns. Two large caves offer visitors a view of subterranean rock formations including two favorites that resemble a giant pipe organ and a crystal dome. If you take a detour off of highway 7 onto Rt. 74 you can travel to the town of Ponca. From here you can reach Buffalo River and enjoy floating and canoeing along one the nations National Rivers (equipment rentals are available). North of the town you will find a trail that leads to Hemmed-in-Hallow, and see a collection of waterfalls that stand 175 feet and travel down huge limestone cliffs - you won't be disappointed by this journey. Traveling further south you will see Arkansas' version of a Grand Canyon. The Buffalo River carved this gorge, leaving behind tall red rock bluffs. In the distance you will see the Boston Mountains. If you care to stay in this area you may want to try the Cliff House Inn (870-446-2292), which gets its name from its position hanging over the canyon itself. Travel shortly down the road and you can take a detour along Rte. 16 to see a massive 130 ft. natural bridge carved out of sandstone by a small stream. The place is known as Alum Cove Natural Bridge Recreation Area. Take a 4-mile detour east on Rte. 16 to see a large collection of rock formations known as Pedestal Rocks because of their unique structure (large boulders upheld by much smaller columns of rock). Traveling further along route 7 will lead you by many antique and craft shops and finally you will enter the million plus acres of the Ozark National Forest. This National Forest offers visitors caves, waterfalls, streams and abundant trails through its forests and prairies. An entire vacation could be spent in this one park. Further south along 7 you will pass through Dover (more antiques) and then through the large town of Russellville and make your way down to Dardanelle where you can visit the Lake Dardanelle State Park. At Rte. 155 you need to head west towards Mount Nebo State Park. On the way you will travel some great zigzag roads that will convince you that a motorcycle is the only way to travel. Another detour you will love is further south where you will want to take Rte. 154 for a great tour of the Arkansas river valley that you can take till Holla Bend National Wildlife Refuge or further up the road to Petit Jean State Park home of a the 94 ft. tall Cedar Falls waterfall. Heading down route 7 further south will make its way through the Ouachita National Forest that offers ample camping and hiking opportunities. Finally the route takes you down into the city of Hot Springs Arkansas with a number of coffee houses, craft shops, art and antique boutiques, and many lodging possibilities. You also will want to experience first hand what the town is know and named for - hot springs. These mineral-laden hot springs can be found at the Hot Springs National Park. There is an operating 'bath house' known as the Buckstaff and the Fordyce that serves as a museum and visitor center. There are many roads in this area that offer a great collection of zigs and zags yet every motorcyclists must travel the road leading up to the observation tower at the summit of Hot Springs Mountain. "At the over look east end of Petitt Jean State Park "
"At the over look to Cedar Falls waterfall in Petit Jean State Park"
"At the entrance to Petit Jean State Park"
on August 17, 2011 2 out of 2 members found this review useful. We did the Highway 7 ride in April 2011. In the rain, the whole way and it was my wife's very first time to ever ride in the rain anywhere. She did great and accomplished it without any problems. Even during the rain the ride is awesome. Just beautiful and as always the Arkansas road quality was beyond belief. This is a great ride and obviously would be better when dry. on October 16, 2010 2 out of 2 members found this review useful. Made reservations at Cliff House via internet, pictures were misleading. Was expecting something along the line of a mountain lodge, rooms were bare minimum, in need of repair. Restaurant was good, rooms were down steps and under restaurant, when restaurant closes you are totally on your own. View was spectacular if you have the corner room, since all other roms have really small window. Ride up mountain to Cliff House was breathtaking lots of twists and turns, heavy clouds enveloped route. Would eat there but not stay again. Booked 2 nights stayed only one, no refunds. on June 6, 2010 2 out of 2 members found this review useful. Hwy. 7 may be one of the most beautiful highways in America. Its got the scenery, twists and turns, and enough gas stops to keep you outta trouble. The area around Jasper, AR is my personal favorite. on October 21, 2017 0 out of 0 members found this review useful. Road itself is great, though traffic can make it a drag. It has a bunch of really wide sweepers that are a lot of fun, as well as some rather beautiful vistas at the northern part of the run. on October 19, 2017 0 out of 0 members found this review useful. This is a fantastic ride. It puts the Pig Trail to shame. on October 11, 2017 0 out of 0 members found this review useful. Just recently took a vacation with a friend on motorcycles, and decided to stay at the Cliff House Inn, cabins. We traveled to Harrison and ran 7 South to Jasper and on to the Inn. The roads offered many great views while riding and curves to keep you busy. The roads were in good condition and the weather we rode in was perfect for Sept,30th. Having this ride at the end of a full days ride, was amazing. Great views at the lookout just a couple miles North of the Cliff House Inn, as well as at the Cliff House Inn. Sun Rise, as well as sun set were sights that photos don't quite do justice. The entire route through the Hot Springs was a breathtaking ride, with elevation changes as well as curves. on October 28, 2012 0 out of 0 members found this review useful. I've ridden this several times. The northern most part of 7 is SPECTACULAR!! Get off the road and enjoy it! There's an abandon recreation park on the east side- possibly the one mentioned above? As you go south it's still very pleasant. The Hot Springs area is great too. My wife and I enjoy spending time there. Arkansas is UNDER RATED imho. on December 10, 2010 0 out of 0 members found this review useful. on August 11, 2010 0 out of 0 members found this review useful. on August 5, 2009 0 out of 0 members found this review useful. This is one of Arkansas best stretch of road. You can't get a better view of Arkansas then from this road. on July 12, 2009 0 out of 0 members found this review useful. I rode this route today. It was a beautiful ride and traffic was minimal. 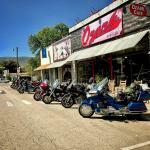 There are plenty of towns along the route for eats and fuel and the people are friendly. on March 6, 2008 0 out of 0 members found this review useful.